This carrot cake recipe is from Joy of Baking. I like a classic carrot cake and this is it. Carrots and nuts (if you choose) are the stars of this cake. For me, there is no place for pineapple or applesauce in a carrot cake. I have frosted this with a mascarpone frosting of my own with some vanilla straight from the pod added as well. Grease two 9-inch springform pans with butter and line the bottoms with parchment paper. Grease the top of the parchment paper and dust the inside of both pans with flour, tapping out any excess. Sift the flour, baking soda, baking powder, salt and cinnamon into a bowl and set aside. In a standing mixer fitted with a paddle attachment or with a handheld mixer, beat the eggs. Add the sugar and beat until well combined and fluffy. Add the oil in a steady stream while the mixer is running. Add the vanilla. With the mixer on low, gradually add the dry ingredients and mix until just combined. Stir in the grated carrots and pecans (if using) with a spatula. Divide the batter evenly between the two pans. Bake in the oven for 25-30 minutes or until a toothpick inserted in the center of the cakes comes out clean. Allow the cakes to cool and then remove from the pan. For the frosting, beat the mascarpone in a standing mixer fitted with a paddle attachment or with a handheld mixer until smooth. Add the heavy cream and mix until incorporated. Add 1 cup of the confectioner’s sugar and mix until well combined. Repeat with the second cup of the sugar. Cut the vanilla bean in half lengthwise and scrape the seeds in the bowl. Mix again until evenly distributed. Your frosting should be firm enough to spread, although if you find it is not, you can chill it before frosting your cakes. 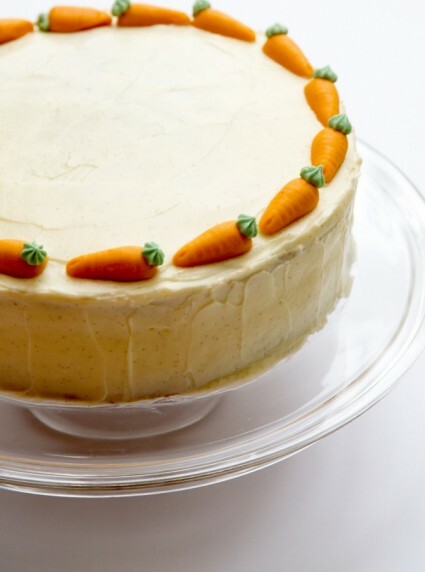 Frost each of the carrot cakes with the mascarpone frosting and then decorate as you like. I like to use the mini marzipan carrots that I can find in my local supermarket. Nuts are also a nice touch for decorating. Store the cakes in the refrigerator until ready to serve.